Ever since Bruce Benward & Tim Kolosick’s aural skills textbook Ear Training has been packaged with the music theory textbook I currently adopt, I’ve made use of it in aural skills labs. 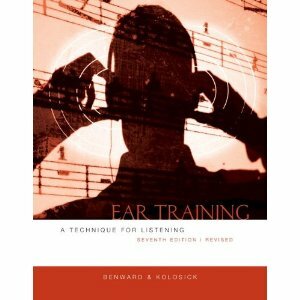 It serves as a convenient source of aural exercises and dictation material. And what I find particularly useful are the error detection exercises, error detection being an absolutely essential skill required of young musicians and one that is often, in my experience, under-emphasized in aural skills courses. Fortunately for students, they are given plenty of extra opportunities to detect errors in the harmonic dictations provided in the ET Teacher’s Manual. Unfortunately, I don’t believe this was the authors’ intention. Being so annoyed by questionable part-writing in these harmonic dictation exercises is likely something of an over-reaction, a byproduct of having spent years grading music theory assignments. Yet here I am, greatly annoyed. The first five examples listed above involve root movement by ascending 2nd in which the root of the first chord descends via passing tone to the fifth of the second chord, the passing tone creating parallel fifths with the tenor voice. Three cheers for consistency! (Some would say (me included) that these passing tones create chordal sevenths, but B&K consistently treat such figures as NCTs, even when involving V chords.) 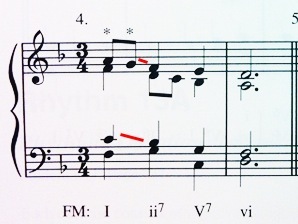 The sixth example above (F major) also contains root movement by ascending 2nd, but the problem here involves the approach to the seventh of the ii7 chord. (More on problematic preparations of chord sevenths in a moment.) 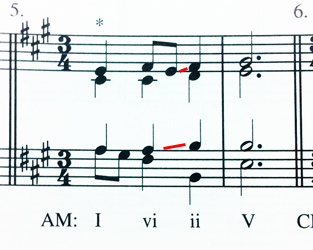 In the final example above, parallels are created by a figure that I always caution my students against–that is, by the insertion of a descending passing tone from a leading tone (or temporary leading tone in a tonicization, as is the case here) to the chord fifth of the following I chord (or of the chord being tonicized–the IV chord in this case). Such a figure draws attention to the fact that the L.T. has been “frustrated” in an inner voice. The parallel fifths in the example below may be less problematic, but only very slightly less. 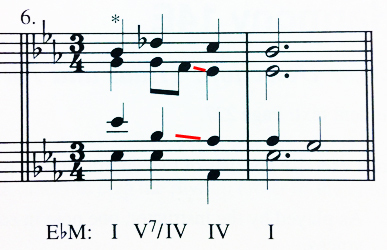 The ill-effect here is slightly attenuated by the fact that the metrically accented D in the tenor is a non-chord tone while the anticipated C# is the structural tone. When the second fifth in a series of consecutive fifths involves a NCT, the ill-effect can be attenuated (to varying degrees depending on other contextual factors). The problem here is the bass’s APT. 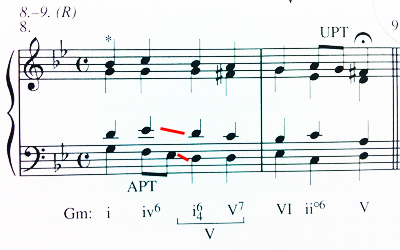 The tenor needs to get to the D at the cadential i64 but cannot easily do so without unwanted parallels, weaker chord voicing, erratic melodic shape, or rewriting of other upper voices, all because of this APT. 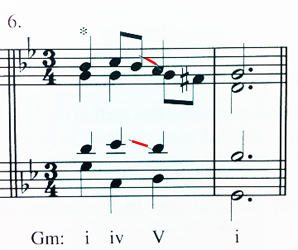 In the passage below, the neighbor tone does double damage: not only does it create parallels, it also essentially constitutes an improperly resolving chord seventh. Here is an excellent example of an objectionable direct fifth. Quite literally a “textbook” example! Want to see some sevenths of chords ill-prepared by descending leaps? Sure, they’ve got you covered. Progression #1 above is quite a head-scratcher. 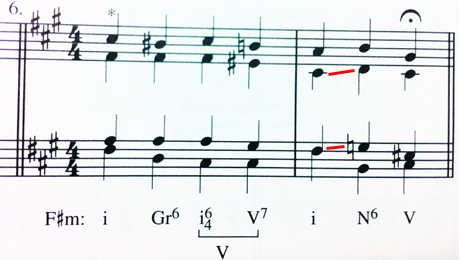 Why on earth is the soprano given a G in the opening tonic chord, doubling the chord fifth? My guess is to give students a more interesting soprano line to dictate, but is that a good reason for dubious part-writing? Progression #2 looks like an assignment from a student who has just learned of the potential part-writing pitfalls in the IV7—V progression. 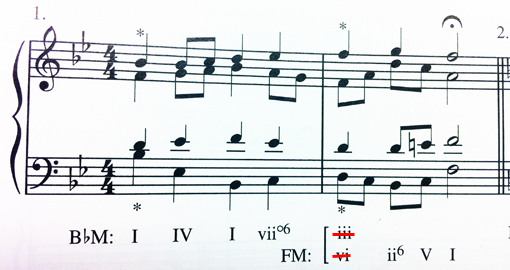 The very reason for the questionable approach to the chord seventh in the V7 here seems to be the prevention of parallel fifths (S/T) (which for some reason had suddenly become objectionable for these authors here??). Progression #3 is an easy fix. 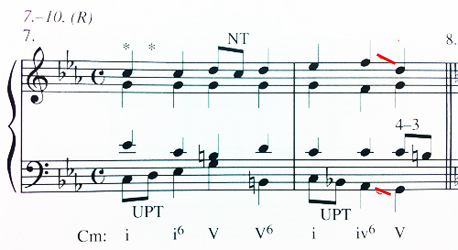 For the ii7 chord, keep the B in the tenor, keep the D in the alto (now the seventh is prepared), and move the soprano to G.
How about improper part-writing involving the N6? Check. For some Harmonic Dictation sections in the ET text, they smartly(!) used actual phrases from Bach chorales. At times, however, their analyses are suspect. In the two examples below, B&K’s propensity to treat all passing figures descending from chord roots as NCTs instead of chordal sevenths leads to questionable analyses. Were I to provide B&K’s given analyses for these progressions, my students would likely identify the suspect “ii—I” progression (okay, some wouldn’t), and they would be right to question it. These leading-tone passing tones do more than merely “pass” through. They carry tonal reinforcement weight, and they, however fleetingly, transform the predominant chords into dominant ones resulting in a more persuasive ii-viio-I analysis. The second problem (admittedly nitpicking here a bit) is that the pivot has been placed in the wrong location. 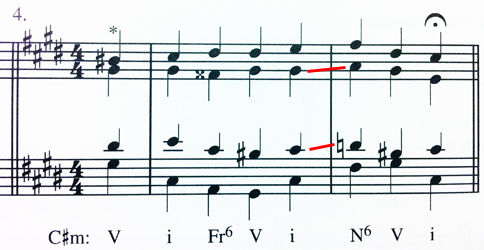 The first indication of F major does not come until the E-natural appears. 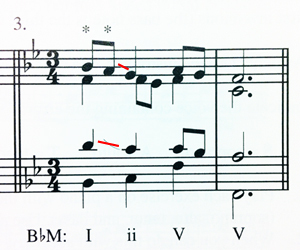 The proper place for the pivot is the ii6 chord in F major, which would be a vi6 in Bb major. Okay, now with all pointless venting aside (I feel better now! ), on to more beneficial things. I’ve been stimulated by these frustrations to do something I’ve been wanting to do for a while, and that is to compare how various part-writing concepts are treated in some of the leading music theory textbooks out there and to see to what extent those textbooks correspond to Bach’s chorale style. Such research will provide an opportunity to re-evaluate not only my grading scheme but also my choice of textbook, something I’ve been reconsidering for a while now. 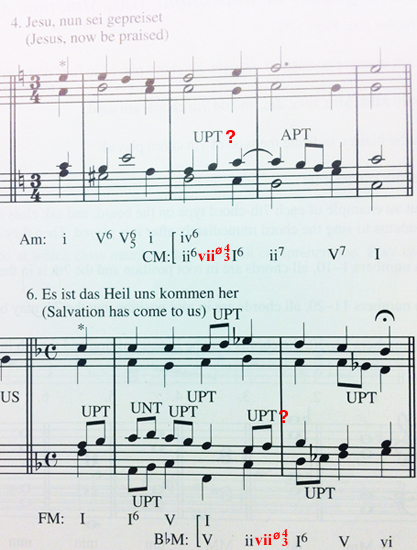 More than an octave between adjacent upper voices? Must do go to ti in a cadential i64 resolution? 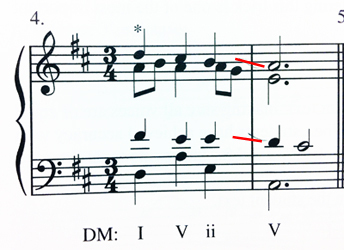 I’ll start (in the next blog post) with the “mistake” most frequently found in B&K’s book—the parallel fifth created by passing or neighboring tone—and go from there. We’ll see how far this takes me. Aside | This entry was posted in Uncategorized and tagged ear-training, music theory, parallels, part-writing, pedagogy. Bookmark the permalink.